In 2008, Clowns Without Borders Spain went to Morocco to support the migrant families that live precariously in the North of Morocco. They performed 15 shows for 3600 people. 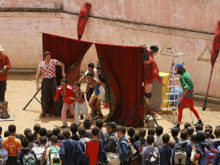 In 2006, Clowns Without Borders Spain returned to Morocco with the support of the Moroccan Committee for Development and Cooperation. They performed 23 shows around Oujda, for 4970 people. In 2005, Clowns Without Borders Spain sent 3 artists to Morocco and performed 18 shows for 4000 people along with “Caravana de la Risa”. 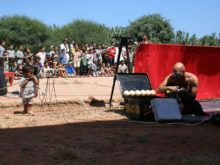 In 2004, Clowns Without Borders Spain implemented a project in Morocco and performed 16 shows for 3500 people.